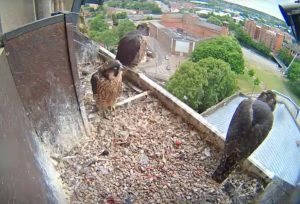 With the Peregrine juveniles now fully fledged there are just a handful of Watch Points left on Cathedral Green for the birds to be observed up close. Each session runs from 11am until 1.30pm. The Derbyshire Wildlife Trust’s volunteers will be there to help everyone who comes along to see the birds and learn about their fascinating lives.